I've encountered a MAJOR issue with MO. I had STEP Core & Extended 2.2.9 installed and running just fine. Today I noticed that 2.2.9.1 was out, so I decided to "update". First, I went ahead and ran LOOT and Wrye Bash just to be sure. 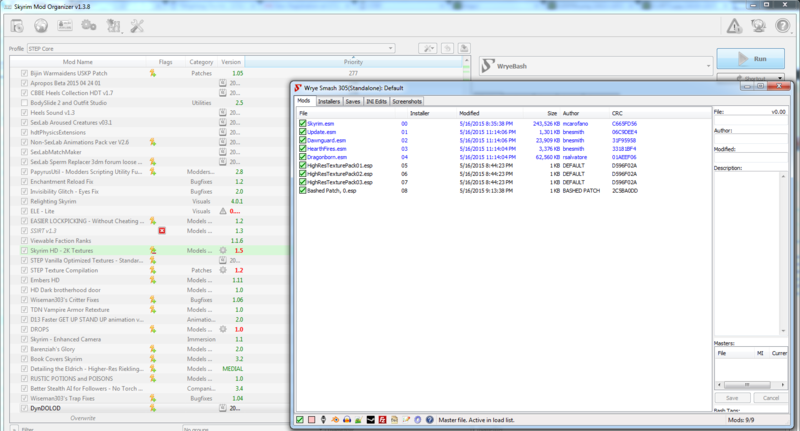 At the time, both utilities showed all installed plugins just as normal. I fired up Skyrim through SKSE through MO, and made a new save. I then exited Skyrim, disabled all mods listed as "removed" or "replaced" in the 2.2.9.1 changelog, and then re-ran LOOT and Wrye Bash. Again, both utilities showed all installed plugins just fine, save for the few that had been removed in 2.2.9.1. I fired up Skyrim again, got the "missing content warning", and made another save. I then exited Skyrim and downloaded and installed all of the new or replacement content in the 2.2.9.1 changelog. Here is where the issue came up. I installed and configured all of the new content according to the STEP guide. I then ran LOOT to set the load order and make the necessary changes to priority and load order rules. Here I discovered that ONLY the "default" plugins were being listed. 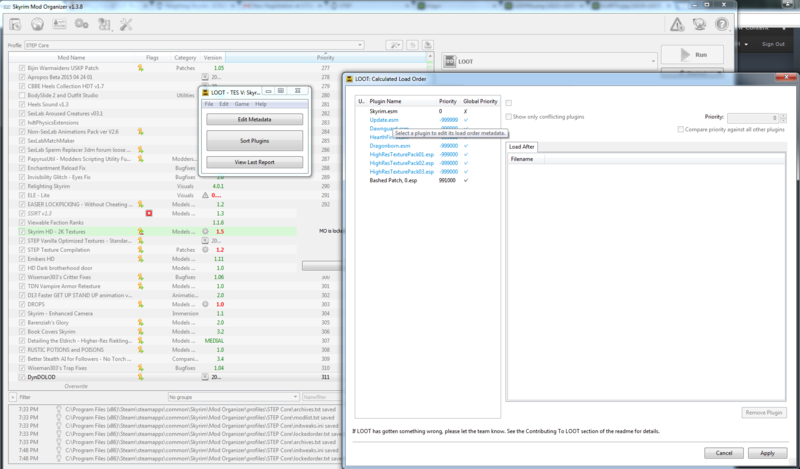 I checked Wrye Bash and TES5Edit, and both of those only show the "default" plugins as well. All of the STEP Core and Extended content is installed, configured, and enabled as per the guide, so there is no reason these plugins should not be listed by LOOT, Wrye Bash, and TES5Edit, correct? 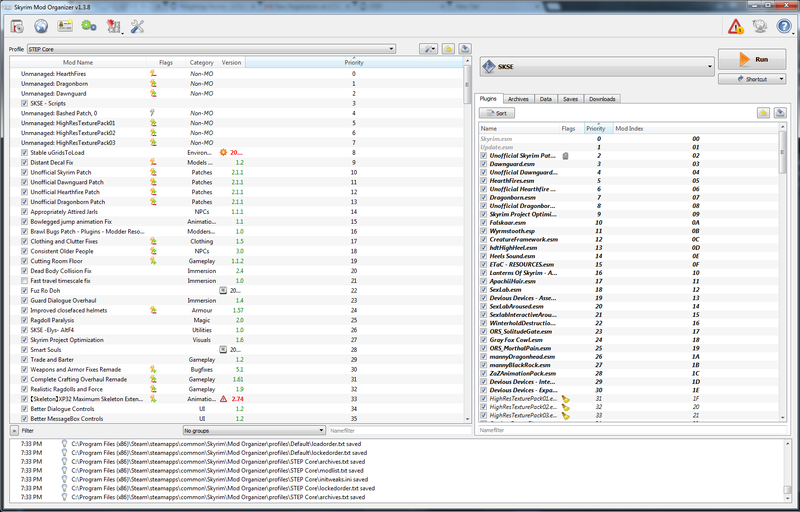 Quick update: I just checked my STEP profile, its plugins.txt and loadorder.txt have all of the plugins listed. 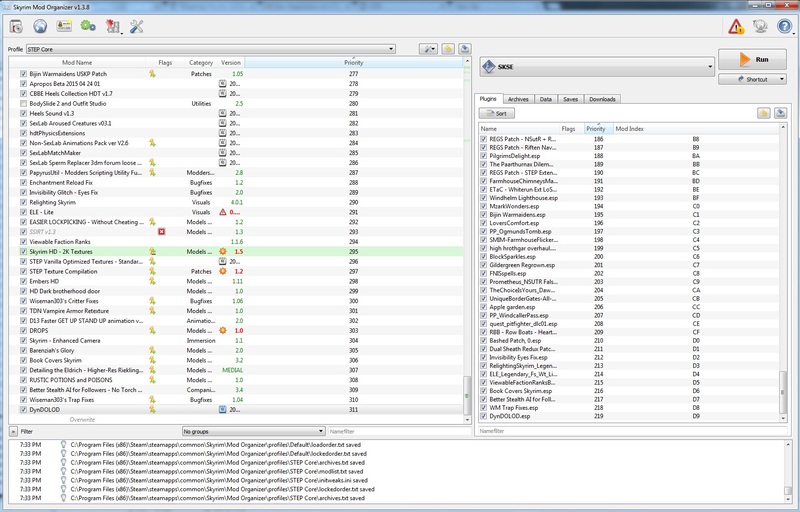 What I'm guessing is happening is that some kind of setting in MO got reset and LOOT, Wrye Bash, and TES5Edit are reading from some kind of "default" plugins and loadorder txts rather than the ones in my STEP profile. I have the STEP profile selected in the drop-down menu in MO, other than that I do not know how to "force" LOOT, WB, and TES5Edit to read from the STEP profile. Is this the issue or am I way off? I don't know how these utilities work beyond what is described in the STEP guides. Which list is being parsed by your tools? If you don't already have one, make a new profile in MO and enable a handful of plugins and then run one of the tools, such as LOOT. If it recognises those plugins, change back to the STEP one and check that. the working directory of those tools was somehow changed to see the default list in your My Documents folder. If you could provide the ModOrganizer.ini for us we can see if any setting is off. Just tested this. I made a "dummy" profile with 6 or 7 random plugins checked, all of them showed up in LOOT's list just fine. Went back to the STEP profile and checked that all of the plugins were checked, still only showing the "default" plugins in LOOT. Further little update. Since making a dummy profile and adding a few randomly checked plugins to it seemed to work, I tried simply creating a new profile and adding and configuring all the STEP Core/Extended plugins as I had before. Did not work. Still only showing the default plugins. So for some reason, a dummy profile with 6 or 7 randomly selected plugins will show said plugins in LOOT just fine, but if I select ALL STEP plugins, it goes right back to only showing the 8 or 9 "default" plugins. EDIT: Okay even FURTHER update. I've deleted all of the installed mods and am now reinstalling STEP Extended according to the 2.2.9.1 guide from scratch. 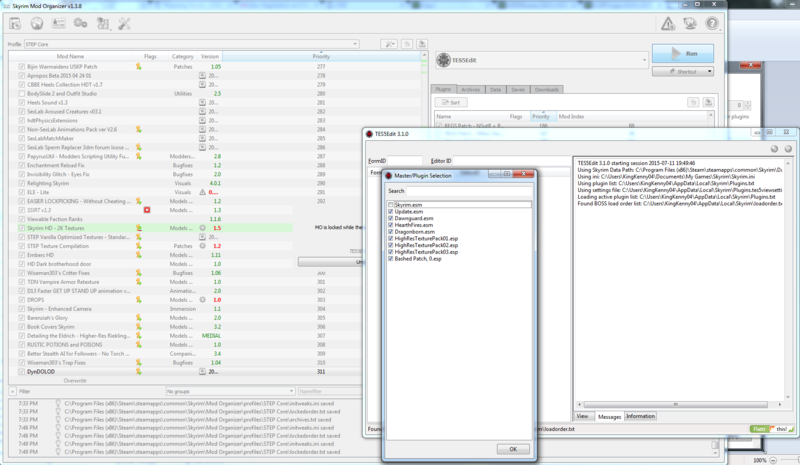 LOOT has been detecting all plugins as normally so far. Edited by KingKenny04, 12 July 2015 - 06:34 PM. Very weird! I would also advise installing any tools like LOOT into folders outside the 'Program Files (x86)' folder. Anywhere else would be good just to avoid potential issues with Windows UAC. Apologies for not returning to this thread. Everything worked as advertised after doing a complete reinstall of EVERYTHING, which was a huge PITA but had to be done. I still have no idea what caused the original issue. I'd like to figure that out if it possibly helps anyone else out in the future, but I'm not sure where to start.